Salman Khan is one of the very few actors in Bollywood, who enjoys a huge fan following on microblogging site Twitter. Ever since he signed on, common fans from across the globe and his friends in the industry started following him and keeping track of his activities and posts on his official handle. The superstar, who will begin shooting for his upcoming film ‘Bharat’, which is an official remake of the successful South Korean film ‘An Ode To My Father’, took to his Twitter account to post an update, as soon as the leading lady was confirmed to star opposite him in the Ali Abbas Zafar directorial. Salman welcomed her in his own inimitable style. Piggy Chops, as the former Miss World is fondly called, went a step ahead and posted an epic reply to Salman’s post, saying that she has been raised in Bareilly and that Hindi was never a hindrance. The banter between the two stars kept everyone talking. 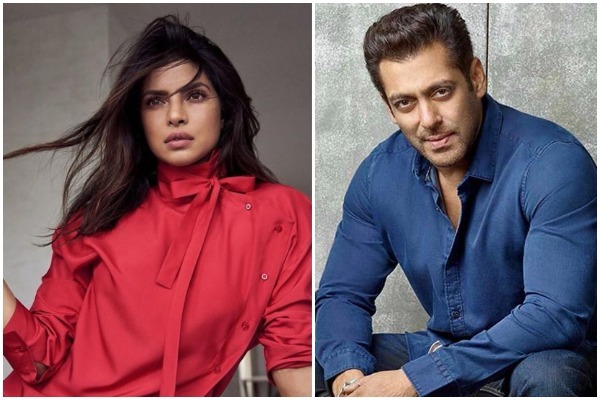 Priyanka Chopra and Salman Khan will be back as the lead pair in ‘Bharat’ after a gap of ten years, post their appearance together in ‘Mujhse Shaadi Karogi’, ‘Salaam-e-Ishq’ and ‘God Tussi Great Ho’. With their chemistry already being the talk of the town, it will be interesting to see them onscreen all over again.